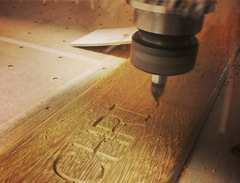 Our Specialised team of wood machinists will manufacture to your exact requirements in all hardwoods and softwoods. We have the facility to create specific tooling from drawings or an existing moulding. We also offer our customers a Manufacture and Assembly service. This maximises the quality of the product and gives us complete control over our deadlines. From manufacturing high end Lab furniture to producing bespoke components for the shop fitting industry we are set up to meet your requirements.